Today's post is a bit of a followup to a post we did a while ago regarding the best methods (in our opinion) for treating our new butcher block counter tops. Now that we're several months into the rather proud ownership of beautiful wood kitchen counters, I think it's time we take a quick look back and fill you in on a few developments and revelations we've had since our install. We've adjusted our approach slightly and it's working really well. From our initial research and investigations most die hard butcher block people suggest you only need to use a mineral oil or chestnut oil to treat the wood. Based on this advice we went ahead and applied mineral oil to the counters in a daily, then weekly, then monthly fashion. We made sure to check on the counters often and reapply when it seemed to be getting a little dry, and we made sure to wipe up any standing water so it wouldn't be allowed to sit, soak in, and stain or otherwise affect the counters. In all, we felt our counter treatment was going well, until we visited my parents' house over Thanksgiving. My parents installed butcher block on their kitchen island a few years ago and they've really liked it. Over Thanksgiving we had the opportunity to check out what they've been using to treat their counters. The first thing I noticed was just how smooth their counters felt compared to our counters. That's my mom at the sink in the photo above, mid Thanksgiving meal prep, so please excuse any disorganization or mess, she had no idea I was taking the photo. I asked my parents what they use to treat their wood and they broke out their butcher block supply arsenal. We're talking multiple bottles here folks. I get my overkill honestly. Of the items they used one struck me over the rest, the Howard's mineral oil plus natural (bees') waxes. While we've been using the mineral oil to treat our counters, I've noticed how it works. It goes on the surface, soaks into the wood, and then we wipe away any excess. 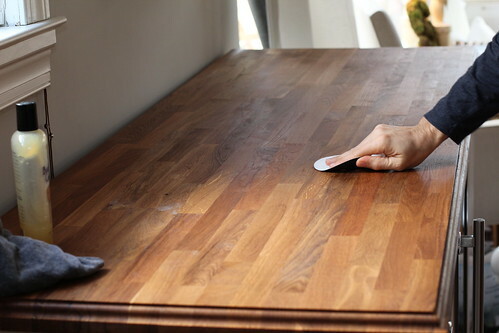 This seems to work well for the short term treatment, but the oil doesn't fill any voids or build up the surface of the counter, leaving any rough surface texture feeling in place. In the case of my parents' counters, though it's a different and smoother species of wood (cherry I believe? ), their surface is almost a little shiny, like it had been polished. They've never treated it with more than the products they showed me, so I assumed it had to be the added waxes they've been using. When we were making our cheese boards from remnant butcher block scraps I used this new oil and wax combo to give it a try, and I was extremely happy with how it turned out. So happy, in fact, that we started using it on our counters. The important thing is that it is still 100% food safe and all natural. To use this wax we employ the following simple methods. After removing all items from the counter to oil (which is actually the biggest pain when it comes to butcher block counters), I hit the whole counter top with a 220 grit sandpaper. It wasn't too major of a sanding job, just enough to smooth out any rough areas that had developed and to remove any surface blemishes from water stains. This is one of those things I really like about butcher block. I only sanded before the first application of the oil and wax, it's not an every time thing. Once I was happy with the sanded look and feeling, I got ready to apply the oil/wax. The most important thing I've learned while using this is to SHAKE VIGOROUSLY. I'm talking whole-body-arm-hurting shake. This will mix the wax and oil in the container, making sure you have a more even overall application. Think about how much better oil and vinegar dressing tastes when shaken, or peanut butter when stirred, same philosophy here, but we're not eating this, but you get the idea. When I apply the oil to the surface I like to spread it all over the area and then begin wiping with the rag to spread it around. I've seen some people say to apply in one small area and spread, but that doesn't work quite as well for me. Once this waxy oil has been spread all over the counters it should sit for a while. The bottle says to allow it to sit for 20 minutes, but I prefer to let it be a while longer. Perhaps a few hours or even overnight if possible. This allows the oil to really soak into the surface and replenish any shriveled and thirsty wood fibers. You can see how much richer the surface color is once it's all been applied. 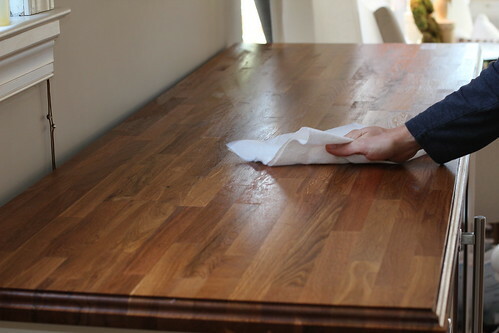 When I feel the surface has drunk in enough of the nutrients, I wipe off any excess with my rag (or paper towels when in a pinch) and begin buffing the surface. This is where the difference in using the wax comes out. While the oil wipes away, the wax stays on the surface and is worked into all of the various voids of the porous wood. As I've repeated the process and the wax has slowly built up, I noticed a significant change in the texture of the previously rough oak counters. The texture remains to some extent, but it's been smoothed considerably, and it much easier to work on. I'm quite glad that we've reassessed our approach over time, and I'm sure we'll continue to do so. There's obviously no "end all and be all" for how to treat butcher block, but now that we've been using this mineral oil and wax combo on our counters for about a month, we've noticed a much smoother feeling starting to emerge. We also notice that the water has started to bead a bit more on the surface, and can be wiped off more easily after being allowed to sit a while longer. What do you think? Is this a good direction to head? My parents also use the "Mystery Oil" on their counter, but putting anything "mystery" on our counters makes me feel a bit apprehensive. Do you have wood counters? If so, what do you use? Note: I'd also like to point out, as with our Toolbox Tuesday posts, we weren't compensated for this review. We simply want to share good products when we see them, and hope that learning from our mistakes can help save you time, money and frustration. It looks great guys! Beautiful countertops. 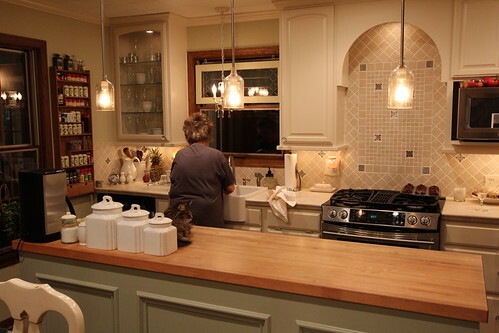 And mom's kitchen too...wow! Thanks, Antonella! We've been really happy with the butcher block. I wish we had done it sooner! I put my bottle of Howard Butcher Block Conditioner in a pan of very hot tap water for about 15 minutes before using it. It melts the wax and allows the oil and wax to blend beautifully with an easy shake, rather than wearing out my "rubbing" arm shaking that blasted bottle! Try it, I guarantee you'll like it! If you snapped a picture of my kitchen during mid-preparation for ANY meal, you'd have something to apologize for. Your Mom is an amazingly organized cook, and her kitchen is gorgeous! Thanks for the update! Thanks for the kind comment Karin! My wife, Alex's mom, is indeed organized as she prepares a meal! Thanks for the compliment on our kitchen as well! WOW, REALLY? it's nice to find detail oriented people, but This is all overkill. heating up the product to melt it? thousands of words to explain how to apply a simple old product? don't you think that Howards would go into all of this if it was important? 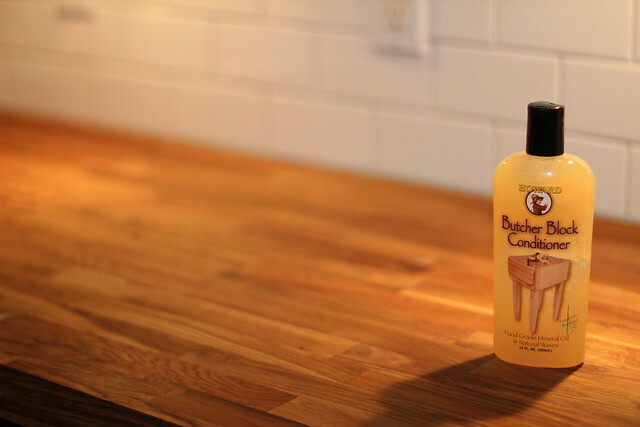 here's my take: Howard's butcher block conditioner is a great product to use and is thicker and provides additional carnuba wax to mineral oil In order to seal the porous nature of wood surfaces that mineral oil alone cannot provide. Use multiple coats to build up and finish and enjoy the shine and water repellency it provides. Make sure product ois at room temperature before applying. CAUTION, heating this product on the stove can be extremely dangerous this product is flammable and when exposed to an open flame it can ignite! I use the same mineral oil on our butcher block counter tops. Instead of shaking the bottle, I squeeze a generous amount into a glass bowl and heat it up on low on the stove to liquify it. I give it a good stir before applying it. What kind of bees wax do you use and where do you buy that? I would love to try this out also :) Thanks for the inspiration, I need to reapply tonight, I'm overdue! That's a great tip, thanks! The beeswax I'm referring to is actually in the bottle, it's a part of the "natural waxes" it refers to. I know there's other wax only products that you can apply as well. We may give that a try before too long and will update with our results. This post got me thinking about a beautiful end-grain cutting board I own. Do you think this same wax-and-oil treatment would work for it? I think it would probably work quite well for the end grain. The only thing I've noticed is a slightly white residue left in any significant voids. If any of the end grain has split that wax may be visible in the voids. That's the only real consideration I can think of. I also used mineral oil on our butcher block counter, and didn't like the results: the rough surface as you mentioned, and the continual oily look, which also bonded a huge amount of dust and grime to the counter, turning it from blonde to grey. I looked around for other options, and found suggestions to use pure tung oil, which is supposed to build up a harder, more waterproof finish. Tung oil isn't exactly cheap, so I kept looking and found the 'Behandla' butcher block finish from Ikea that contains tung oil. I took a chance, completely sanded down the counter and applied several coats (5?) of the Behandla. Several months later it still looks great and hasn't needed nearly as much care as a mineral oil finish. It is much more waterproof, but not completely, has a very natural look, and is a bit more durable. I'm getting ready to install new unfinished butcher block on some small kitchen counters. 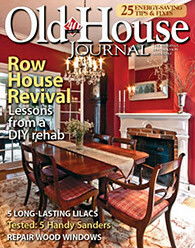 Based on information here, at other websites, and common sense, my plan and advice is to do off the bat what you wound up doing: begin finishing the wood with mineral oil, which is the "wettest" approach and should provide the best penetration, then switch to the waxy mix for its smoothing and filling qualities. As an aside, although I am an oak lover, I wouldn't advise it for those looking for the smoothest finish given its relatively large grain. When we had our floors redone, I had our butcher block counters sanded and refinished as well. Our expert who has worked on many wood projects in The Sea Ranch, CA area insisted that mineral oil is truly the best way to go as the wax will build up over time and makes it more difficult to keep the food working space of a butcher block counter clean/healthy. And it is less problematic for when you re-sand the counter- given that added build up of wax to get through. Wondering what the consensus is for cleanliness/healthy food prep and later refinishing. We started with just the oil and did that for a while. But our counters are the Ikea oak, and the grain seemed somewhat pronounced with a fair amount of surface pitting. Since moving to the wax/oil combo, the counter seems more smooth and consistent. Obviously the wax has some part in this. I'm also lightly sanding rough spots before an oil/wax application. I do notice some buildup of the wax on the sandpaper, but it's not too severe. The main reason we moved away from mineral oil alone is because of the way it would stay wet for so long and ultimately allow the counters to dry out too quickly. I've known several floor guys over the years. The hard and fast rule is that almost all wood refinishers hate the idea of wax for this very reason. Personally, I like the performance of the oil/wax combo, but I'll never be a person who applies any sort of paste wax directly to the counters, as that would surely cause issues with sanding out imperfections. Beeswax contains a natural antiseptic substance...Propolis. The bees use this to bind and keep the hive clean. I am using a mix of 4 cups linseed oil, 6 ounces of beeswax warmed to liquefy, and enough mineral spirits to make one gallon, all this is stored in a new gallon paint can from the hardware store. There is an even better finish though, a mix of half resin ( available from bee supply companies (Root), and beeswax heated in a stainless box like container OUTDOORS over a portable propane burner. The beehive wood is dipped in where it bubbles just like fries. When removed and allowed to cool the liquid mix is absorbed into the wood. It's good for 12-15 Years outdoors. At which point it can be renewed. So... Beeswax is a perfect additive for wood finishes... Indoors or out. Hi Alex an Wendy, love your site! I have a question for you, if you don't mind? My husband and I have just installed butcher block counters, white oak, and am wondering if I can put mineral oil and wax on them. They will not be used for food prep so I have finished them in a stained danish oil. I have an under mount sink in them and am a little worried that the danish oil will not hold up around the sink but I really don't want to varnish the tops. Do you think I can now put the mineral oil and wax on top of that for a better water barrier? Thanks for your advise! We have actually been redoing our old house for 11 yrs and the kitchen is the last space!!! Hi Michelle, and thank you! I definitely think you can do an oil/wax combo treatment on your surface as a sort of water barrier. I definitely wouldn't varnish the top. The risk around the sink is that the water would actually get between the top layer and the wood, making it an even worse situation of trapped water and eventual mold/rot. I believe you can apply the mineral oil/wax on top of the Danish oil treatment without issue. Not 100% sure, but it seems reasonable based on my experience. Just be ready to reapply the oil/wax somewhat frequently around the sink, as it will undoubtedly dry out quicker with more water exposure. We tend to do ours every three weeks. Hi Alex, Not trying to scare you for such a quick reply, we own a small business with a lot of computer time! I went ahead after reading your blog and tried it. I am on my second coat and it looks great! I really think it's going to be perfect! I was wondering how often I would have to apply it. Not afraid of the time it takes to up keep it. Thank you so much for this blog I honestly had no idea what I was going to do!!! It's funny you said that, we have been looking at the other rooms again going "we could do this better now"! It gets in your blood I guess. 29 years of marriage today and have redone 3 houses!This is our last. But like you two, many critters running around getting in paint and caulk. Thank you so much!! what is the name of the oil/wax product that you use, after the 1st time you put it on, how often did you put it on? do I need to use it daily for awhile? I have had new butcher block countertop put in a month ago, my contractor used Emmet's good stuff on them and they are already back to raw wood. It didn't work. So now we are trying to find out what to do. You need to oil them a lot at first to ensure they soak it up, then you can do a bit less. We started with just straight mineral oil. We did that once a day for a week, then once a week for a month, then you can go to once per month. You can use any plain mineral oil (that you can even buy at the drug store). The stuff we use now is what this blog post is about, Howard's Mineral Oil + Wax combo. It works great and we typically apply it once per month now. You can tell when you need to apply it as some gray spots begin to show up. I am happy to find your site! We, too, have the Ikea butcher block (in beech, not oak) and have been using mineral oil for 5 weeks now, first 2x/day for a few days, then daily for several more, then weekly, then every other week. I STILL feel like it is rough and water doesn't bead up hardly at all. I was just about to give up and put a coat of polyacrylic or something on it, but I am going to follow your lead! We also installed a sink right into the butcher block counter, against the advice of some other folks. It's good to know it's working for you! Your counters look great! I just renovated my kitchen and installed the beech numerar after being assured by your (and a few others) blogs regarding the ease of upkeep. I decided to use the howard's oil + beeswax product and do like it...but my counters still feel very dry. Should I continue to use the product daily until that ceases? They look so beautiful, I'd hate to mess them up. I'd continue to use it and it should feel less dry over time. With out counters we kept oiling/waxing every 2-3 weeks for the first 6 months before they didn't feel dry. Also, when you apply the oil, don't wipe it off 20 minutes later like the instructions say. We like to leave it on at least overnight, applying in the late evening and then wiping it off in the morning before making breakfast/coffee. Good luck. Just purchased a 30 yr old bb table & sanded off the old wak & grime down to a gorgeous maple surface. I used it to replaced my island top. I've just put on the 1st 2 coats of BB oil when my husband found yr site. I think I will look for the oil wax combo before I am done. How many coats of oil should I do before I go there? Thanks for your help! Your BB sounds great. Should have a wonderful patina on it! We did the oil for about 2 months before starting on the oil/wax combo, but I'd think you could start after the first month. We waited only because we didn't know about the product. Today, before oiling/waxing each time, I use a 220 grit sandpaper and just hand sand to take out any imperfections and get the surface smoother. Now, after a year of waxing/oiling about once a month, even our oak tops that used to be a bit grained and rough are getting quite silky smooth. I figure it's the wax and sanding that's really making it nice. I just bought my first cherry butcher block top from Lumber Liquidators. Didn't realize that I had to do anything to it. It will be gently used in a home office with an occasional cup of coffee or glass of water and my kitty jumping on top. Its very Blonde in color which I would prefer a more browner appearance and need to protect it in case I spill something. I do not need to protect it from writing/pen marks as that won't happen, but wouldn't mind it being a little harder from dents anywya. Should I use the plain mineral oil for about a mth (the way you did it 1x a day for a wk, etc) and then switch to the Howards Oil/wax once a month? Do you sand every day when you first start doing the min oil 1 x a day everyday? Will this darken the blonde to a browner color? Sorry, never done anything like this before. Very excited that I saw your blog. thanks so much! I too just bought butcher block from lumber liquidators - maple. Getting installed today in fact, so been doing some research. I saw on one site a mention that they didn't condition the underside of their Ikea Numerar, so it warped. Are you doing anything to the underside of yours? Thanks! We didn't do anything on the underside but haven't had any warping issues, and it's even above the dishwasher. Hi there! Your countertops are beautiful! We also installed ikea oak butcher block counters in our kitchen in March this year. We treated exactly as you did to begin with, mineral oil every day for a week, once a week for a month, and approximately once a month since then. I purchased the product you recommended in this post because I wanted our counters to be a little bit smoother, shinier and more water-repellant. We applied last night and wiped off the excess this morning. We found that there was a lot of excess, much more than when we used mineral oil, which we would always apply fairly generously. So, I'm thinking we can probably apply less next time. After I wiped off the excess, the counters still felt pretty greasy, how long should we expect that to last? Would you recommend we apply this product a few times in the next couple weeks, or just maintain our once a month routine with this product instead of mineral oil? We had the same experience when we first started using it. The wax and mineral oil does seem to remain a bit greasier for a longer period and we also wipe off a fair amount, even after letting it sit for 12 hours or so. I think it's safe to both use a little less and to apply less frequently (just once per month). I've been wiping with a paper towel once all is said and done and that's getting it pretty clean. We usually try not to set papers and other items that could get ruined by grease on the counters for a few days after we apply. Now that we've been doing it for a year the counters are much smoother than they originally were, but I'm not sure when that started. I just noticed it in the last couple of months. Thanks for all of the post you've made regarding installation and care of your counter tops. I've started applying mineral oil (or paraffin oil as we call it in Australia) at this stage. I was wondering if you've continued with the butcher block conditioner and if your happy with the results over a longer period? I'm just getting to work on my Ikea oak butcher block top on my new island and I'm a newbie at this! I'm ready with a bottle of Howard's Mineral Oil & a bottle of Howard's Butcher Block Conditioner (beeswax with mineral oil). I'm questioning whether you still think oiling for a month before using the wax combo is important? I will use this for for prep, and want a good, non-staining, smooth surface as this island is sort of seem from every room except bedrooms! Any updated advice, now that you have more experience? Love your sight, and your writing is so clear and to the point! I forward you to several wood-crafty decorating people! Oops... I meant I will use it for FOOD prep! However, I will probably not chop directly on it. Alex....We have a maple Boos butcher block approximately 20 years old. We were told when we purchased the block that a parafin and mineral oil mix was the best product to use. (one part parafin to 2 parts mineral oil) I first SCRUB the block and allow to airdry. I used the combination AFTER heating on top of the cooktop, then pouring the mixture directly on the block, allowing to absorb overnight. Removing the excess and returning it to the container it was stored in. I then repeat the process every couple of months with this same mixture. I have never sanded this block and it is still in excellent condition. My question is should I continue this treatment or try your recomendation? The question is should I stop this procedure and commence to using your recomendation? 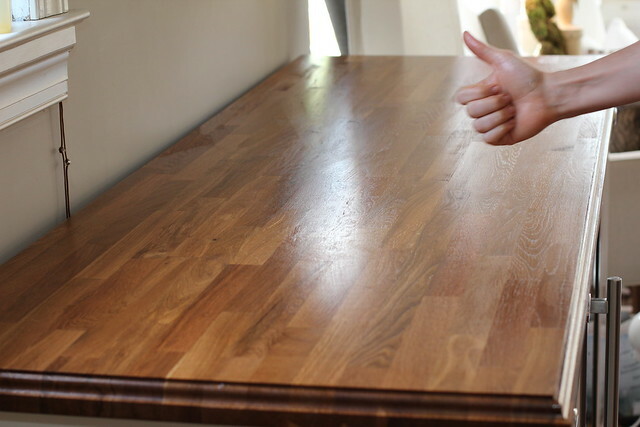 Thanks so much for sharing the butcher block finishing process. We plan on following your recommendation. I was wondering what process you used to attach the counter tops to the cabinets? I know I need to figure out what kind of finish is on all the other wood work in the house. It's all so very dry and thirsty looking. I love your blog! I'm a friend of Alex's coworker Beth and she pointed me here in her security system research - but then I got lost for hours reading about your projects! I found this update on your countertops and love it. I moved into a house with butcher block countertops and have been using mineral oil but was wondering if the Howard's was worth it and glad to see it is! 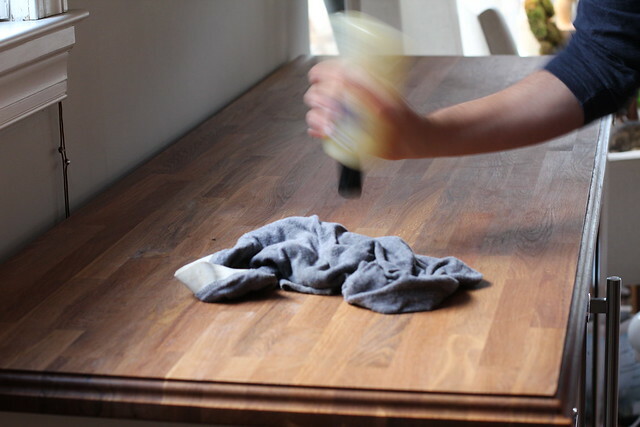 We do have a couple of stains - and places the counter is more worn, do you have any tips on sanding? I'm a bit afraid to do it Your house is beautiful! All of your hard hard work has produced a lot to admire! Hi Katie! Welcome to our blog. Very glad you found us through Beth. Thank you very much for the kind words. We really appreciate them. As for the butcher block, just start sanding! 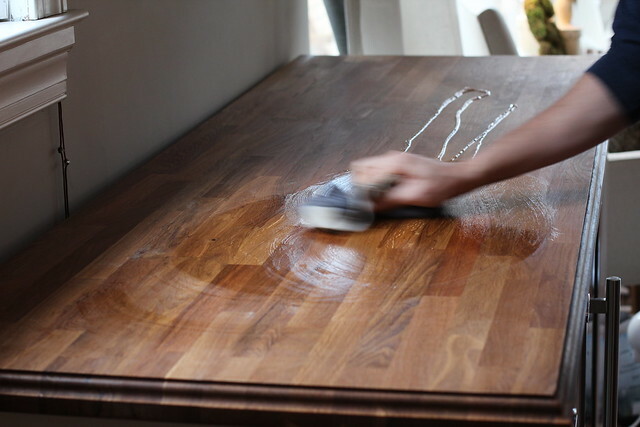 We sand almost every time we oil to take care of any stains or issues. Use 400 grit paper and just hand sand in a small spot and feel the difference with your fingers. It's so soft and smooth when you're done. Then oil and you've got yourself some new counters. Start small and then you'll see, you won't be shy about sanding more and more. Absolutely LOVE your blog and would like some advice. We are picking up our Ikea countertops in about a week and want to make sure we treat them right. What frequency of the wax/oil blend application do you recommend for brand spanking bare countertops- and would you apply to the underside of the counters a few times before installation? Thanks so much for all the advice and tutorials! Keep up the beautiful work! We've done nothing to prepare our underside of the counters and have had no warping or issues, but that's not to say it's the way it should be done. I've heard of people sealing them with something that hardens, like poly, but I feel like that might cause issues. Essentially, if the top is going to breathe some, the bottom should too. So I might try to use something like walnut oil for a few days on the bottom. Best of luck! 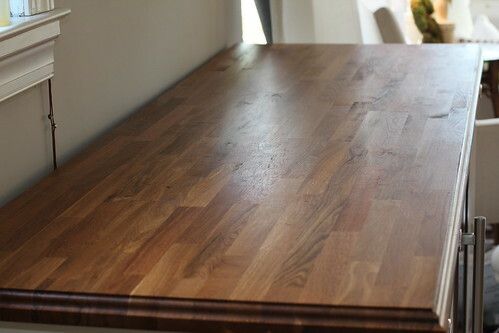 With the IKEA butcher block counters, is it safe to apply a stain to darken them and then cover with the oil and wax? I have applied a dark tung oil, but the color does not hold. I do not prepare food directly on the countertops, always use a cutting board and am quite consistent in keeping the counters wiped up and clean. I really want the color darkened, but no sealant like Waterlox or polyurethane. Hi, Lori. I wouldn't stain the countertop, especially if you're not covering with watelox or poly. Keep in mind that a stain is simply a coating that goes overtop of the counter, and only affects the very surface. You then cover it so it maintains the color. If you don't topcoat, you'll likely lose a lot of that color onto items you have on your counter over time. While I've never tried it or seen it done on butcherblock, you could try something that's more of a dye, like aniline. That actually changes the color of the wood's fibers, rather than just applying a stain covering. However, I'm not sure what that does to your surface, and I'm relatively sure you won't like how it ultimately looks with oil applied. Sorry I can't be of much more help here. Since we didn't change our block's color, I don't want to steer you the wrong way. Thank you for the advice regarding staining. I have just completed another application of dark tung oil, after a light sand, and am becoming more pleased with how the color is changing. I am guessing the tung oil and Howard product will be fine together, both are oils. How soon can I begin with the Howard product after the tung oil application? Thank you for all of this information! My husband and I have made the decision to go with butcher block for our new countertop and you have helped answer many questions about care through your blog entries! The one question I have left is about day to day cleaning. I'm used to keeping the windex bottle near and spraying that on our tile countertop. With butcher block... what would I use for everyday cleanups? Thanks again! Excellent post. My wife and I just bought a Stenstorp kitchen cart with a butcher block top from Ikea. Stenstorp recommends using just Behandla wood treatment oil for the wood surface. I read the specs on the product and it is a linseed oil compound. Aside from the oil there is nothing there to really protect the wood from incidental surface contact from liquids for extended periods of time. I like the idea of the oil and beeswax combination here. I have used various waxes on wood and other materials in a manufacturing environment for years. In my opinion it does extend the coated materials longevity when in use. I can see the advantages here with this product. Thank you for sharing this. We have found your site useful, thank you! One item is that we installed the Ikea Beech counters nearly two years ago...the large peninsula board warped so terribly that we had to reinstall (this time from a local fine wood manufacturer, where my husband works)! It was due to us not having put mineral or another oil on the bottom first, we are told by several local woodmakers of countertops. The narrower normal sized counters did not warp, even above the dishwasher (where of course we installed the aluminum flashing which Ikea recommended). But now we have used that large board, cut it into more countertop and open shelving (hubby is very handy). The local carpenters recommended straight mineral oil as you did too, but Behandla is still our first choice for treating and keeping our counters lovely. Our sink also is a drop in from Ikea...have no issues at all. Thank you for your info, it's been helpful as an added word of wisdom in caring for our countertops! They have such a warm feel compared to laminate or granite...just lovely and inviting! Hit this website looking for a Howards product review. Good info. I'd like to throw out there Lumber Liquidators has a good selection of bblock also. Its good 1 1/2" stuff, I went with them because my main counter is 9' and didn't want a seam. They sell a few selections in 12' lengths. I got maple and it looks beautiful! Your counters look beautiful! So if I have just started applying oil to my new cherry butcher block-two coats so far- would I need to sand if I wanted to switch to the wax/oil combo? Or could I apply on top of this just oiled wood? My island top has not yet been used and with just two coats of mineral oil wasn't sure which would be the right path. Thanks so much! No, you won't need to sand, you can just start applying directly. The oil/wax just adds wax as a components. Made a 24x48" cutting board table from salvaged stair case hard pine and 2x4s. My intended goal is to use it exclusively for homemade pasta preperation. I entertained the idea of applying an epoxy resin to the top, but now that I read your post and reviews, I think your mineral oil/bees wax method would bring out the natural grain and have a nice natural luster. Question; any experience with interaction of fine 00 pizza/pasta flour with the oil/wax surface...will the flour stick to it or stain the surface? Great site!Thank you for providing clarity in details of different projects. I have maple butcher lock counter tops that I oiled with mineral oil . I picked up the combo oil/wax that you spoke off and definitely see difference in finish. We tend to get water stains on backsplash and countertops after a while especially behind faucet sprayer. I sand it lightly then oil and it looks great. Just curious how deep should you sand the stains down? I lightly sand and after oiling it I can see some of the stains very lightly. Are you supposed to be sanding to remove the raised grain and surface grey area of water spot or deeper ? Thank you for your help. Just sanded down a maple butcher block slab(it was being used as a work area in husbands shop). Guess we will try the the mineral oil / wax. I am a little confused now as to whether or not we should start with straight up mineral oil first or not.It will be in a vacation home so it will not be used all the time but also won't get the attention that has been described. Have time to season it before installing hope it will be ok.
Was gazing at your mom's beautiful kitchen for the longest time before I noticed the lovely ornamental kitty cat lounging on her island. Ha, ha. We just installed butcher block countertops in our home. We are installing a sink and we're wondering if you would recommend silicone to seal the sink? Hi, I am an older woman with a shoulder injury. All the upkeep with Howard seems like a lot, but it sounds like the superior approach. I am having a handyman come today to apply Howard, but I can't imagine hiring him monthly. Any recommendations? Its not the application of the oil, its the sanding and rubbing that may aggravate my shoulder. Do you think I can do this today, and then wait till I notice a greying/shine loss before the re-sand (at 400 grit) and the re-application/rubbing? So it may be more like quarterly? Any experience with "waiting" between applications? Any other advice? I'm sure it has been asked on here....but I didn't want to read ALL. The posts...sorry! We are having our butcher block countertops installed shortly....my question is should I start with just mineral oil first for the first month or so or do I just start with the mineral oil/wax combo? If I start with the oil/wax combo do you still recommend once a day for 7 days, once a week for a month etc...??? Oh and yes your counter tops are beautiful!!!!! Thank you for your blog and tips!!!!!!! How much oil do you use for one application? I'm about to start on mine and not sure how many bottles I'll need. 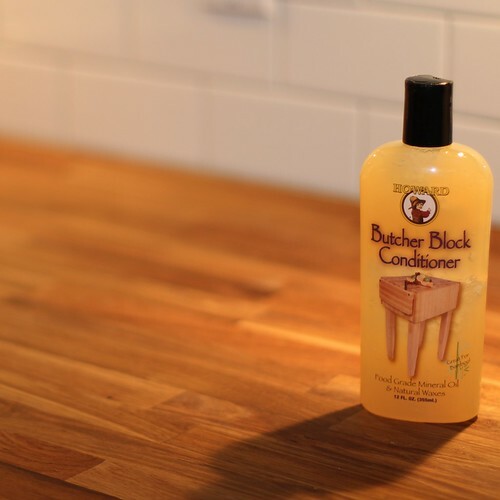 1) Since starting to use the Butcher Block Conditioner, do you still also us the mineral oil? 2) In this article you mentioned using chestnut oil, but the previous article talks about walnut oil. Are the two interchangeable? Or is one better than the other/contain different properties? Our butcher block countertops desperately need sanding/ oiling due to previous occupants not caring for it and its now has mildew around the sink pretty bad. We plan on sanding and oiling but have been practicing on a freshly sanded butcher block cutting board so we didn't mess up the counters. We've been using Howard's conditioner but it always has a greasy finish. Will the countertops always be like that too? Even after thoroughly wiping it down with paper towels it still is a little greasy and will show on your hand when you run it across the board. I put more oil on the board just about every time i use it/ wash it bc the water still seems to soak into the board, it doesn't bead up on the surface after i've used it. Any recommendations? Thanks for the great posts. I appreciate your sharing the results of your research and experience. Hi, I love your countertops. We have been using the Howard butcher block conditioner for 2 months (our countertops are acacia and just put in.) However, any paper set on the countertops (even after treating weeks ago) gets oil spots. Do you experience this? Will this always be the case? Any tips? Thank you! Have new John Boos countertops. Is your experience still the same with Howard’s conditioner. Still the sole product you use? Still happy? Did you sand you counter tops to get the factory finish off before installing and starting with the mineral oil? only use the tack cloth after getting most of the dust off.. and use it very lightly, its sticky & you don't want to get the tack cloth residue on the wood. rub the conditioner in like your waxing a car, rub it in good & wet.. let in tack up for a couple days..rub more, you could even squeegee off excess. I used to work in museums to do finish work.. but going up in sandpaper grit is your best prep.. if you want to get really fancy, get wet sandpaper & sand using mineral spirits- the best finish you ever have.. ( prior to waxing..
Now that it has been a few years, I’m curious how these countertops have held up? Do you still love them? Are you finding any issues with heat or water? I love the look, and I’m thinking of installing these, but I want to make sure I know what I’m getting into! Thanks in advance! We still like them a lot, but there are enough problems to say we don't absolutely love them. We'd certainly do it again, and like butcher block a lot, but these Ikea counters have had enough issues to select a different and higher quality manufacturer. One section began to bubble/delaminate a little, while another section has a little white area that's visible. The worst section is probably an area immediately to the right of our stove where the butcher block began to split down the middle. It hasn't moved over time but with humidity/water the section raises and falls. I may try to epoxy it and sand it smooth, but it's a little annoying. I've been using Watco Butcher Block food safe oil. It is tung oil with a slightest bit of polyurethane in it that evaporates after 72 hours. after two coats it had build up a good clear coat on the top. each coat sand down with 400 grit sand paper as when you apply oil to wood the grain will raise up a number of times. So go through until the grain doesn't come up again after applying. Then if you would like to add a layer of the Howards that is being referenced here as a top coat after this. The product is food save but I would not cut directly on it. I would have a section for a board from left over countertops that you only apply the Howard's too for cutting. Very helpful information! We bought a pre-owned home from our neighbors (yes, we actually moved next door)! They had a solid hickory countertop made for the island and have treated it with mineral oil... it's beautiful! Size is 5.5 feet by 3 feet. What size bottle of the conditioner do you buy? How many applications do you get from it? Does the conditioner last indefinitely? 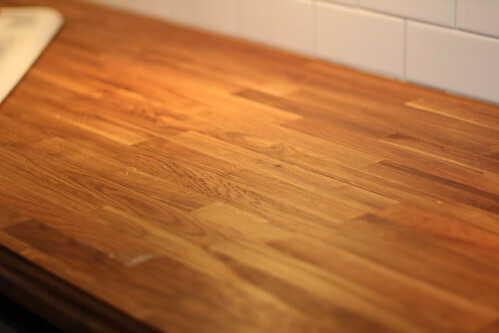 I have new butcher block countertops and have applied mineral oil once a day for 5 days now. I’m not totally satisfied with this procedure and would like to go the beeswax way. Question, do I need to sand before applying beeswax or can apply right over the 5 applications of mineral oil? Hi there. I have new IKEA counters. Would you recommend using mineral oil first or can I just go straight to the conditioner? Thanks for your generous help! Wax works great. But there is a problem with it if you ever wanted to change the finish, like to Waterlox, which is a beautiful and more maintenance free. With an oil finish you can go straight to Waterlox, but the wax prevents adhesion and makes any other treatment undoable. SO once you wax you are committing to that type of finish.